What’s the Best Tripod for Video? Looking for the right tripod can be quite an undertaking. There are hundreds of offers on the market, and they all seem to promise the same. In this review, I looked at five popular and highly rated video tripods and will tell you what I think about them. Before I go on to explain how to find the right video tripod for your purposes, it’s important to know what makes a good video tripod in general. Obviously, we need our video tripod to be stable. Not only do we want a steady picture, we also need to make sure our video gear (including lenses and microphones) is safe. A tripod shouldn’t easily tip over or stand on shaky legs. Shooting video can be very demanding to your gear. You don’t want to be ready to shoot the big scene only to find that one of the legs is broken (btw, I totally broke my friend’s tripod once when it slipped out of my hand). Of course, one of the most important aspects that affects durability is the material. Plastic is just not going to be as durable as metal. However, the design and the manufacturing quality play a big role here as well. How can we get smooth pan and tilt motions? The answer is: With a high-quality tripod. While many cheaper tripods rely on cheaper pan-tilt heads, more expensive tripods often possess so-called “fluid heads”. A fluid head is a tripod head with a fluid chamber inside. This chamber helps dampen all sudden movements your camera is exposed to, which makes it much easier to create smooth panning and tilting shots. The bad news about fluid heads is that they’re usually more expensive than other tripod heads. However, there are some use cases where you might not need a fluid head. I will talk about these more in the next section. What’s the best tripod for you depends highly on what you want to do with it. Different tripods are made for different purposes. When it comes to shooting films (or videos with a film character), there’s one tripod feature that’s especially important: smooth panning and tilting. That’s why a tripod with a fluid head will usually be the best choice for filmmakers, videographers and YouTubers with filmic content (even if you’re just shooting sketches!). Another thing that’s especially important for shooting films is that your tripod is able to hold the weight of all your gear. While that’s obviously important in any case, filmmakers, professional videographers and ambitious YouTubers might have a heavier rig which might include heavy lenses, microphones and lighting. You want to make sure that your equipment is safe at all times! Vlogging is a pretty broad term if you think about it: You might want to do simple sit down videos or you might want to film yourself while walking around or travelling. Maybe you even want to do both! Both cases need a different tripod. Since these requirements are so contrary to each other, many vloggers use at least two tripods: One for sit down videos, and one for mobile vlogging. If you carry your camera around, a monopod (which has only one leg) or a gorillapod (a small tripod with flexible legs) can be a good solution as well. In my review below I looked at one tripod that’s comparable to a gorillapod. Also, in most cases, vloggers don’t need a tripod with a fluid head. 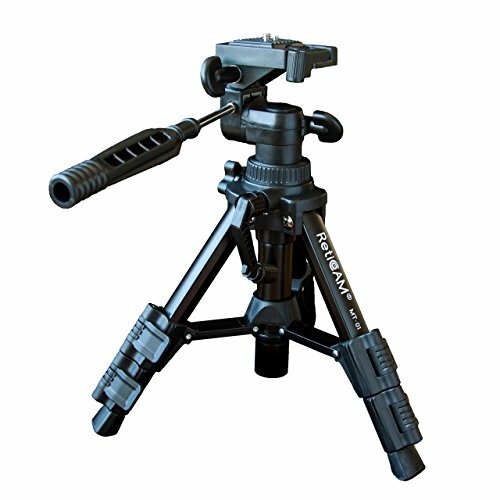 The RetiCAM MT-01 is a so-called "tabletop tripod". That’s why you might want to consider this tripod if you’re planning to shoot “sit down” types of videos like vlogs or tutorials. At it’s smallest, this tripod measures 10 3/4” (27.3 cm), and at it largest 19” (48.3 cm). Thanks to the aluminum construction, this tripod is relatively lightweight (1.5 pounds) but durable. With the 3-way pan and tilt head, you’ll be able to do mostly smooth tilts and pans. I’m saying “mostly” because it depends a little on what you’re expectations are and how skilled you are at moving it. Having said that, if you’re not planning to shoot ambitious films with this, you’re probably going to be fine. (If not, get one of the fluid head tripods below!) The RetiCAM MT-01 comes with a small, convenient travel bag. Since this is a smaller and lighter tripod, be extra careful if you’re using a heavier camera. This tripod by Lammcou stands out from the others on this list because it is the only one with flexible legs. Flexible, in this case, means that you can bend them anywhere in any direction, which is pretty convenient if you want to film from unusual angles or in small spaces. 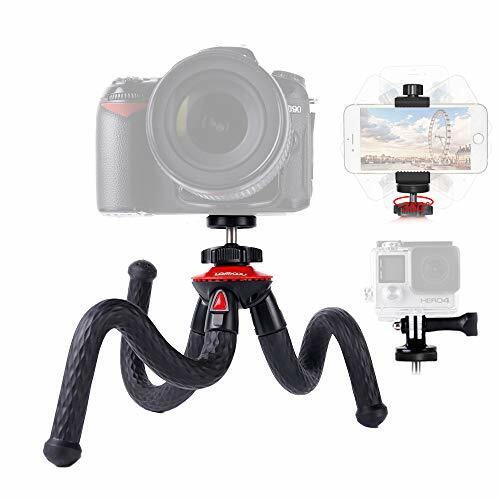 The rubberized material will help you wrap this tripod around almost any secure structure. It is basically like a sturdy gorillapod - but more lightweight. Like the RetiCam Tabletop Tripod on this list, the Lammcou is a mini tripod. But where the Reticam is meant to stand on your desk, the Lammcou is designed to accompany you wherever you go. That’s why it also comes with a universal phone holder and an action camera mount. So if you want to film with a phone or your GoPro, the Lammcou might be a good choice. I’ve actually been trying this tripod for vlogging and am really happy with it so far. It fits well into my hand luggage and is easy to hold for longer periods of time. Now, while this is a great tripod to take with you, it does have disadvantages when you want to do more serious filming: It does not have a pannable or tiltable head. As a vlogger you might not need that, but if you want to shoot films or simply create more complicated videos, this might not be the right tripod for you. 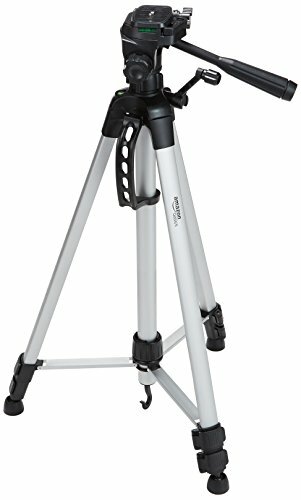 One of the most popular budget tripods on the market is the AmazonBasics 60-Inch Lightweight Tripod. At 2.77 pounds (1.26 kg) it is not as lightweight as the RetiCAM MT-01 or the Lammcou Travel Tripod - but let’s not forget: This is a full-sized tripod with a height of 60 inches (152.4 cm). It has a quick release mounting plate and a 3-way pan and tilt head. Unfortunately, both tilts and pans can be somewhat jerky - that’s why I wouldn’t recommend this tripod if you want to create moving shots for your videos. However, I have used it successfully for all kinds of static videos - usually when I film myself. It is also important to mention that the AmazonBasics 60-Inch Lightweight Tripod is all plastic. This means that I wouldn’t recommend this tripod for heavy users. Still, the AmazonBasics 60-inch Lightweight Tripod is a decent choice for vloggers, YouTubers and hobbyfilmers who are just starting out. Now we’re getting into high-end territory. Manfrotto is a popular brand among videographers and is known for its quality tripods. Of course, this quality comes at a price - and that’s the main “con” of this model as well. However, if you can spend a little more, the Manfrotto MVK502AM might be worth looking at. It comes with a fluid head with 60mm half ball, twin legs that help with the rigidity and a middle spreader that adds to the stability of the construction. The material is part carbon-fiber, part aluminum, which is great for durability. 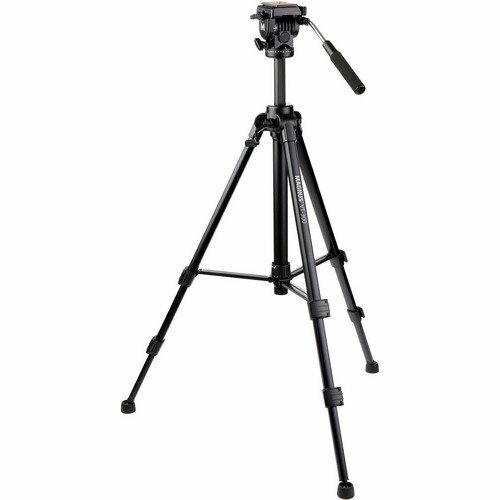 All of this means that this tripod is not only stable and reliable, it will also allow you to pan and tilt smoothly. That’s why the Manfrotto MVK502AM is a great choice for filmmakers, ambitious YouTubers and professional videographers. The Magnus VT-300 Video Tripod is a quality tripod that might be a good choice if you’re looking for a tripod with a fluid head for smooth panning and tilting but don’t want to break the bank. In fact, the Magnus VT-300 seems like a crossover of a good budget tripod and more high-end tripods like the Manfrotto MVK502AM. This is evident in the construction (a mixture of plastic and metal) and the design of the tripod. If you haven’t worked with a fluid head before, the Magnus VT-300 might be quite the revelation. However, it is important to mention that while most buyers seem to be happy with the smoothness of the panning and tilting, some have reported that their fluid head can get stuck slightly in some positions or after not using it for a few minutes. However, this shouldn’t be too noticeable in most cases. Result: What’s the best tripod for video? If I had to announce one overall winner, it would be the Manfrotto MVK502AM. If you have the money to spend, getting the MVK502AM might make your life as a videographer or filmmaker much easier. Its high-quality design and materials will deliver the stability and durability you need, while the fluid head will help you get those smooth pans and tilts you hoped for. However, if you’re looking for a more budget-oriented solution, the Magnus VT-300 is a great alternative. And the best travel tripod? If you need a tripod to travel with, the Lammcou Travel Tripod is my current favorite. It is lighweight, flexible and fits into my (small) backpack with ease. That also makes it great for vlogging. Since it’s a mini tripod, you might have to improvise in some situations. A good alternative is the AmazonBasics 60-Inch Lightweight Tripod. While I personally don’t like it that much as a stationary tripod, it does its job well as a travel tripod (or use the even smaller AmazonBasics 50-Inch Lightweight Tripod, which is very similar).